Dempsey Lambert (standing second from right) stood silently for 90 minutes. Chairman of EA Drainage for half-a-decade, why would anyone expect more? It seems that nobody, not regular citizens or the development community, not even the Parish Council members who will make the decision on Thursday, are all that happy about a parish-wide limitation of fill material to three feet. 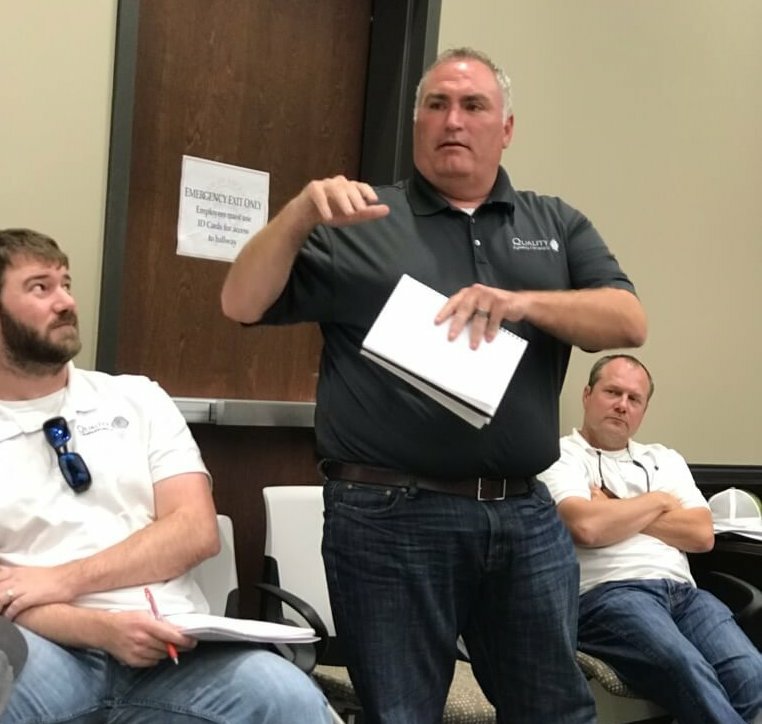 An awful lot of questions without many answers, Monday’s discussion about “fill to achieve Base Flood Elevation” at Ascension’s Governmental Complex conference room failed to inform four council members in attendance. How will Bill Dawson, Dempsey Lambert, Daniel “Doc” Satterlee, Todd Lambertt, and their colleagues vote on Thursday? Planning Director Jerome Fournier explained, sort of, the proposed ordinance that would cap fill, mentioning two other proposals; Zero Net Fill and a basin by basin analysis with particularized regulations. There are, depending on the source, six to eight distinct drainage basins in Ascension Parish. “We know the basins are different,” Fournier conceded (Prairieville is high and St. Amant is low). The council members did not tip their hands with the Lamberts never uttering a word. Why would Dempsey Lambert have anything to contribute? He has only been on the Council for 15+ years, six of them as Chairman of East Ascension Consolidated Gravity Drainage District No. 1 (commonly referred to as EA Drainage Board). Lambert’s District 5 has been the focal point of residential subdivision development in recent years. It saw some of August 2016’s worst flooding as longtime residents watch mountains of fill pile up to accommodate their new neighbors who stayed high and dry 31 months ago. 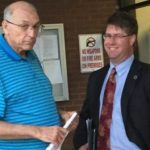 Unable to get an answer from his own council representative, it was Councilman Satterlee who reminded everyone that multiple moratoriums have been brought before the Council without the necessary votes. And “mountains of dirt” are not limited to District 5 as one Quail Creek (District 11) resident attested. She “flooded twice in Metairie” which prompted the move to Prairieville. “Something needs to be done with the drainage and not in favor of the developers,” she said after describing the fill material piling up at two nearby subdivisions; Brookstone and Reese Lane. Her councilman, Benny Johnson, was not present but the engineer who performed the Drainage Impact Study for Brookstone was in full throat. A St. Amant resident agreed, arguing that limiting fill to three feet would force her to build on pier and beams, effectively pricing her family out of the market. Another worried that an existing pad built on 5′ of fill, resting atop a 2.3 acre lot, would be subject, ex post facto, to the new ordinance. Nothing that transpired on Monday allayed those concerns and their council representative, Randy Clouatre, was not present. Pervading the conference room was a palpable frustration over the myriad issues never having been discussed much less resolved. Councilman Satterlee provided the timeline, beginning with his first taking up the issue in May 2017 when the item was included on a Strategic Planning Committee agenda. It was removed by his committee-mates to EA Drainage where, in August 2017 HNTB was tasked with recommending solutions. In May 2018 HNTB presented its work product, consideration of which was delayed/deferred indefinitely by EA Drainage Chairman Dempsey Lambert. Political pressure to do something, anything, prompted the full council’s decision sending it back to Strategic Planning, now chaired by west bank Councilman Oliver Joseph. In a single meeting the current proposal was forwarded to the Council which considered the committee recommendation on March 21, introduced the current ordinance on April 4, and scheduled public hearing and a vote for April 18 (Thursday). Satterlee called the vote “a no win situation” for himself and his colleagues. Their constituents could say the same.